I almost let the opening week of December pass me by without getting a month preview posted. But never fear, your social planner is here. If you're looking for a longer distance race to get some final supported long runs taken care of before your January marathon, there's plenty to choose from. My busiest months at work happen to coincide with the peak of racing season; however, that hasn't stopped me from taking part in events. Now, I just don't have time to recap on here everything that's going on. That being said, I'll be running the vast majority of these races, and look forward to letting you know how they turn out. It may be July before that happens, but your patience will be rewarded. I promise. YMCA Corporate Cup 5K: Second Line for Literacy (Saturday, December 06th @ 8:30 a.m.) - Benefiting adult literacy programs, teams from corporations as well as individuals will cover 3.1 miles through City Park on Saturday morning. The first 1,000 finishers score coffee mugs, and all finishers will enjoy a great spread of post-race food. Baton Rouge Beach Marathon & Half (Saturday, December 06th @ 7:00 a.m.) - Finally in 2014, the running chicken is turning legal. I've run the double loop course through LSU's campus and around the lakes several times, as my first marathon and 3 times since. The big draw for me is the small, quaint feeling of the race that still pays close attention to detail. Also, great post race food always lures me in. See this year's finisher medal in my bling preview HERE. The Tammany 10K & 1-Miler (Saturday, December 13th @ 8:00 a.m.) - The Tammany Trace is the setting for this new event on the calendar. Commemorative medals are promised to all 10K and 1-Mile finishers, and it's a rare opportunity to qualify for a seeded position at the CCC10K. Celebration in the Oaks 2-Mile Run / Walk (Saturday, December 13th @ 3:30 p.m.) - This 2-mile fun run is a great family event that is stroller and child friendly. Post race access to the Celebration in the Oaks light display in City Park is an added perk, as it is open to race participants before the general public. Be on the lookout for Santa for a pre-race photo! Festival of the Bonfires 5K / Half-Mile (Sunday, December 14th @ 8:30 a.m.) - Celebrate the lighting of the bonfires along the Mississippi River levee with this racing tradition. Registration includes entrance into the festival. Dashing Through The Dome 2-Miler (Friday, December 19th @ 6:30 p.m.) - Another new event on the winter racing calendar is a race that takes participants up and down the ramps inside the Mercedes-Benz Superdome on the evening prior to the 2014 New Orleans Bowl. All participants get a ticket to the next day's big game! Ole Man River Half Marathon & 5K (Saturday, December 20th @ 8:00 a.m.) - The New Orleans Track Club hosts a great event year after year with this race, handing out long sleeved tech shirts to all half participants, as well as unique finishers' medals that feature a tiny runner that moves along the course. 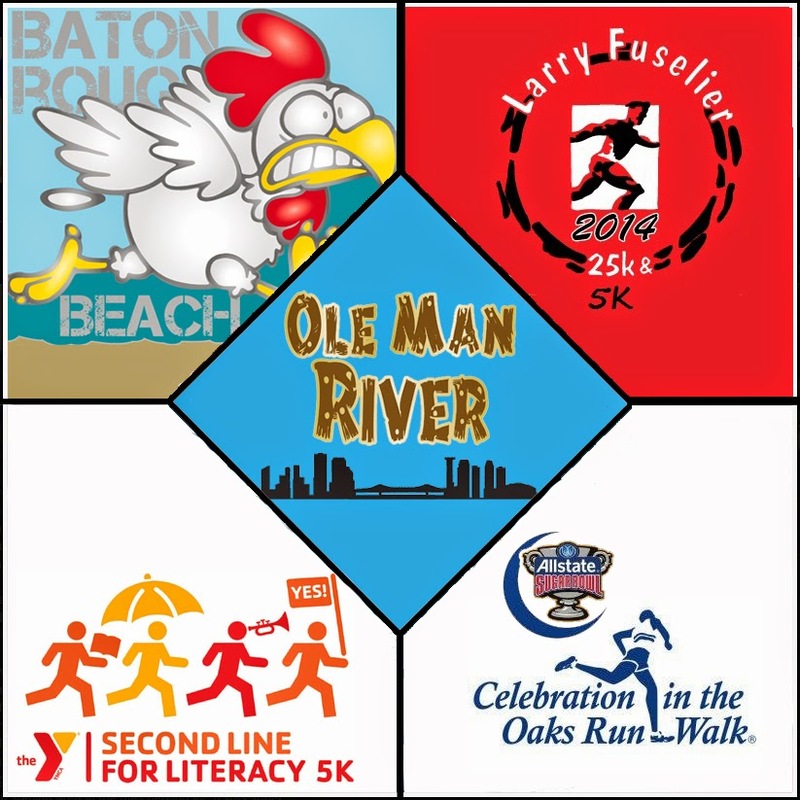 Larry Fuselier 25K & 5K (Sunday, December 28th @ 8:00 a.m.) - I'll use the 15+ mile run as a final long training run for my January marathons, as I like the idea of water stops set up for me during my trek. The 5K runners and walkers also get to enjoy the perks, as everyone receives the traditional gloves in lieu of participant shirts.